This entry was posted in Me & the French: the great divide., Uncategorized and tagged beach, Blogging, Expat in France, humor, humour, Life, Miscellaneous., Theft, Young love by Multifarious meanderings. Bookmark the permalink. “…and resolved to follow in his wake wherever he roamed”. I still remember your phone call to get his address when he was at Gervais’ appartment in Nice ! PS. To be fair, PF HAD given me the address. He had just omitted to tell me which of the ten zillion appartments he was waiting in. I was waiting for a red one. You paint a wonderful picture. Thank you! Painting in words is so much easier than with paint – you can go back and change it if you get the tone or the colour wrong. Cool! I have an almost starring role in your tale. Thanks! That was a brilliant story. 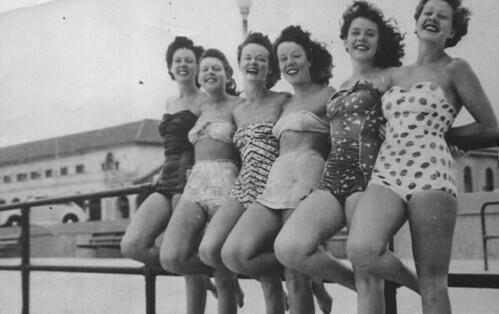 Which of the six bathing beauties (obviously taken before you lost your modesty) are you? I would have had to feed himself to the bears as I’m the cook. I don’t know what he’d think of that. I thought second from the right was you. I just wanted to make sure. Freaky. Now I have to find the same cossie and chisel my thighs down by half. You’re telling porkie pies. You said you only had 10 kg. to lose. Yep. Five on each thigh. Hahaha, hilarious! Probably not at the time, but the way you tell it 😀 I’m literally laughing out loud! I’m worried that Mrs Sensible will want to chop me up into little pices and feed me to Gisele and Scooby Doo now because you were reading about a half naked blogger on the beach. I hope you explained that it was a case of Benny Hill and not Mills and Boon (vomit). It’s funny to imagine people laughing all over the world – I’m going to do myself a laughometer map to see how far the dreaded chortle has struck. Yours is most definitely the closest to home! You never know, you might have a set of silent secret admirers in your very own village. Have you never been spooked by the sound of hysterical chortling at midnight brought on the wind from down t’ road? Yes, I’m regularly awoken by hysterical laughter, but it’s always PF when he comes to bed and finds me asleep with an open book in my hand 🙂 I don’t think any of the locals find me funny for my blog, although they may think I’m strange by local standards. Had to google Malindi there – nothing better than improving your general knowledge 🙂 I must admit that finding a man in his undies in the undergrowth who is clutching a woman’s hand bag and manhandling another man could initially be a source of suspicion. Poor man! I’m glad he caught the thief – I have an unfulfilled need to slap mine so hard he’d end up with his kecks on back to front. Brilliant… It could have been worse I guess, you could have been on one of those ‘special’ beaches that the French so love. That would have made the hitch-hike home interesting! Ha ha, superb! I nearly choked on a midget gem so I wish I’d taken your advice and put them down first. Love the image of the coach load of tourists applauding your bouncy 100m dash! Hilarious! Hey, we could spark off a reverse trend in shopping, empty the stores, close down international stores and give a chance to small local producers.. fire up the British economy through reviving small-scale production… Just from flashing our wobbly bits about a bit. Maternal Mahem causes commercial meltdown…. All right. I’ll calm down now. Deal. I’ll have a bauble hanging off each ear. We drop the binbags on the count of three. We’d better have the army standing by on full alert!! PN, I’d forgotten that one!!! I love that whistle in the middle. Now I’ve got it stuck in my head. Well done. What a great day this will be. Because of your blog I am starting the day with a big smile, ready to take on the grouches in my life. That was ingeniously clever and visual. Lovely! Hilarious….this post AND your comments!!! Can’t stop laughing at the RV dweller addressing your perky ‘lactation facility’ :lol:. she was carrying a rubber ring? Of course she was 🙂 She also had Dora armbands, and a rubber duck in her hand to keep people entertained until David Hasselhoff arrived on the scene. I am crying. CRYING. Buoyancy aids. Hahahahaha. Lovely story. PS I’ve seen these flip flops that have thick soles with a hidden pocket where you can stash a key and your cards/cash. Maybe a good idea? Unless you’re in SE Asia because everyone steals each others shoes. It’s a thing. What flummoxed me was that the people sitting beside our stuff didn’t do anything whatsoever to stop the little ratbags from pinching our stuff – they just gaped at us as we ploughed past them. Hahaha to James Bond flip flops and yikes– people need to watch each others backs! I agree- but I’ve noticed that although many people expect others to look out for them, it never crosses their minds to do likewise… Luckily, not everyone is like that though. Now I’m off to slip into my Ursula Andrews bikini and my platform flipflops, and I’ll sing “Diamonds are forever” on the balcony. Yep! Those were the days. At the time you might have cursed it all, now we’re all in for a good laugh! Oh, yes. The days before breastfeeding, when bras were just for decoration 🙂 Glad you enjoyed it! hahahah bras for decoration, i never even had that joyful time! Love this story…you tell it so well and had me laughing although really awful to have your things stolen like that…grrrrrrrrrr! I’m happy I got you smiling. Bon après-midi à toi aussi – profites bien des rayons de soleil. A bientôt! Hilarious, darling. Best line: running up a sandy beach is about as easy as swimming across a pool full of baked beans wearing a ball gown and a pair of lead-lined Doc Martins. I’m Helena, and I’m cheating on Andra’s prompt to say hi to the person above you — I’m trying to say hello to everyone there. Drop by sometime — I write quirky stories myself *usually*… lately they’ve been sad — so if you want the funny, visit the table of contents…. Hello, Helena! I’m glad you popped tround to say hello. Gosh, it’s getting busy in here today… pull up a chair and I’ll grab a bottle of rosé and some glasses. It really IS that difficult, believe me- not that I’ve ever swum across a pool of baked beans, but never say never, hey? I’ll be delighted to come for a mosey around your blog. I like reading everything, not just funny stuff – I hope I won’t discover that your sad posts are due to real life, though. That was truly a case of “George, don’t do that”. 🙂 Wonderful writing as always, MM. Some of those images will stay with me for a long time. Onboard lactation facility had me choking with laughter. 🙂 I’m afraid we’re too wary nowadays to leave stuff unattended on the beach, but back then we were more adventurous too. “George, don’t do that” is my favourite sketch 🙂 Sorry for the visuals that will stick in your head… That’s the beauty of verbal painting for you, I suppose! Giggling fairly uncontrollably at this. Heh. If it made you giggle uncontrollably, I’m happy. If you’re reading it alone in public and giggling uncontrollably, I’ve scored extra points. 🙂 Glad to see you’re back online, by the way!! I wasn’t in public but my cat did give me A Look. I have just been rereading some of your old posts to cheat myself up. I think this is one of my all time favourites. PS To the amateur camera. I once cut off a girls pigtail during a lesson. I wasn’t totally naughty, I did leave her with the left one. I wonder if she remembers that particular art lesson. Why do you need cheering up, PN? Hope you’re ok. I’ve put a new post on line today – that might help too. As for cutting off pigtails: I should tell you it’s bad, but i’m jealous because it must have been really good fun. The ‘people’ can I call them people? Who rent my house in the UK have decided to stop paying the rent and see how long it takes me to evict them. I am not a happy bunny. Oh no 😦 Hopefully UK law is better designed than French law for getting people to pay up or leave. If not you could try gentle persuasion tactics (prawns hidden in backs of wardrobes is a good idea). She is a bit annoyed with them at the moment. I dare not let her loose with her wooden spoon. I think that some Sicilian passion would do them the world of good – with one visit she’d redefine the expression “to beat around the bush” for ever. Cads! What a great story though – and well told, as always. Love the Joyce Grenfell. It’s years since I’ve read any of her stuff. Thanks, Miss Cuttlefish. I agree- and I love the word “cads,” haven’t heard it for ages! It is a beauty isn’t it? I feel very 1930s (or 1950s? ).